I’ve always felt sorry for RKO. After all, this was the studio that produced (among many others) the original King Kong and Citizen Kane, but it is the only one of the ‘Big Five’ of Hollywood’s Golden Age not to survive to this day as a production company, that distinctive logo of the radio mast emitting high-pitched radio waves not featuring after 1967. Although much of their output to modern eyes amounts to mere names, they did produce some forgotten gems- Double Dynamite(1951) among them. 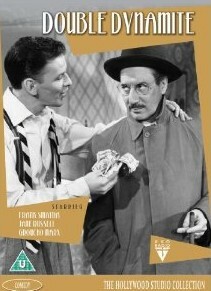 Double Dynamite(1951), Irving Cummings’ last film in a 30 year directorial career, is actually really enjoyable, unsurprising given its provenance (its stars are Groucho Marx, Frank Sinatra and Jane Russell) but surprising given that it is overlooked by most film critics and historians, who dismiss it in three words as a ‘later Groucho film’. A ‘Groucho film’ it is though, and one made, astonishingly, over 20 years after The Coconuts- the first film to star the Marx Brothers as an ensemble. The one-liners in Double Dynamite(1951) are not, however, confined to Groucho- although he is the centre of the comedy that otherwise would be in rather short supply. Jane Russell (barely recognisable as the same women who starred in The Outlaw and The Paleface only a few years earlier) is adequate, Frank Sinatra rather stiff as her would-be lover. The whole premise of the plot requires Russell and the audience to be at one- and will Johnny Dalton (Sinatra) to succeed. Instead, Dalton’s absence of personality creates a sense of deep frustration. One of the oddest things about the film is the song ‘It’s Only Money’, sung by Groucho and Sinatra whilst on a fast-moving soundstage. Musicals don’t claim to be “realistic” (or plausible) in all elements, but this is such a jarringly bizarre moment that one is left wondering why it was done in this way. Added to that is some clumsy editing early on and Sinatra’s uninteresting characterisation, making Double Dynamite(1951) in some respects a missed opportunity. These comments made, the performance from Groucho Marx (then 60 years of age) is truly remarkable, and one that peps up every scene he is in. Indeed, one easily forgets that Johnny Dalton is meant to be the main character as he is eclipsed by Emile J. Keck- one of the great characters created by one of the great American entertainers. Another key strength of the film is its temporal setting (Christmas) and its highly effective mise-en-scene, which enables several superb individual shots and set pieces to come to the fore. The musical aspects of the film are present, but subjugated in favour of the comedy which is largely verbal but occasionally also visual, bordering on farce at times. The straightforward (though rather bizarre) plot is dealt with inside a running time that leaves the audience feeling satisfied (a more recent version of the story would probably be spun out for at least another 20 minutes, which would be to its detriment), and the whole film is good value entertainment. On the technical side, the release comes with a trailer but no other extras. The print quality is excellent, and certainly assists with the enjoyment of the film. But, despite everything, it is Groucho’s film- of that there is no doubt. 'Double Dynamite' is available from Odeon Entertainment.